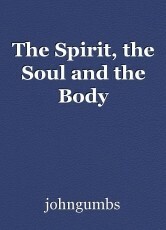 There are many books written on the subject of the Spirit, the Soul and the body; there are many articles as well. I hope in this book to make it clear what the three are, and what they are doing. According to some passages from the OLd Testament. world. The body--well, what can I say--I am functioning at the moment in one, and all around me, I see other bodies.